1. How to follow the progress of my order on the website? Please note that the data follow in our carrier is only available within 24 hours after shipment. You will automatically receive an email with tracking information of the shipment once the order is shipped. 2. I live outside of France, and tracking my order is "Deposit". Why? Unfortunately, there is no tracking available for some countries in europe after deposit. You may have to wait between 3 and 12 business days after the deposit before receiving your order. 1. How much will the shipping cost for my order? - For France, the shipping is free above 50 euros ttc purchases. Below, the fare varies between 2.90E and 9.90E by weight and volume of the order. - For Overseas Shipping is from 4.50E. - For the European Union, from 4.90E. - For the rest of the world, from 6.90E. To know the exact price of delivery of your order, simply make a simulation directly on the site by adding products to your cart. 2. What delivery methods do you offer? For countries of the European Union, shipments are made in "Export 3J Europe " or "Colissimo international". For Belgium, it is also possible to be delivered in relay point. For orders to other parts of the world, the shipments are made in "Colissimo international" or "Export 3J International". 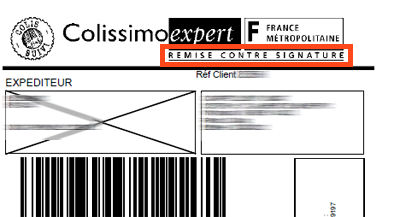 For France, shipments available are "lettre max", "Colissimo", relay point (So Colissimo) and Chronopost 13. 3. What are the shipping deadlines? Placed and paid for before 12 by credit card or paypal order, the delivery time is about 48H 24H by Colissimo and Chronopost (except Mondays, weekends and holidays). These periods may vary in case of unusually severe weather, strike the post holiday season or out of stock (indicated on the website and when your order). The time may vary between 3 and 12 days worked. These periods may vary in case of unusually severe weather, strikes,holiday season or stock failure (indicated on the website and when you order). 4. Where do you ship ? We deliver our products worldwide. In case of problems during the transition from order, please contact us by email. 5. What if the package is damaged in delivery? If the package appears damaged upon delivery, open it in the presence of the deliveryman to check the contents. If products are damaged, complete a mandatory of damage with the carrier. If the package was deposited in mailbox, bring it to the post office the same day or at the latest the next day, and complete a mandatory of deterioration with a teller or refuse package. This document is essential for the damage insurance to work. Otherwise, your application will not be supported. 6. I chose a shipment Colissimo and the package was deposited in my mailbox without signature. What to do? However, if you choose a registered item, the package was delivered to your mailbox, and the label of the package marked "Distribution WITHOUT signature", you can send us an email to let us know the problem . 7. The delivery of my order seems to be delayed, what to do? As a first step, check the tracking information on the carrier's website. They are accessible from the email that was sent to you when your order ships, or on your account ( click here for more information ). You'll know where your order. If you are unable to obtain more information carrier and the shipping date is more than 5 working days, please contact us by email stating your order number so that a claim can be filed. 8. If I'm not at my home at the time of delivery of my order, what will happen? If you have selected an item without signature, and you are not present at your home, the order will be deposited directly into your mailbox. If the package is too large, a notice will be left by the postman, so you can get the package at the post near you. If you have selected a deposit against signature and you are not present at your home, a notice will be left by the postman, so you can recover the letter at the post near you against signature. 1. What payment methods can I use it to order? For customers residing in France, it is possible to pay by credit card, bank transfer, money order and paypal. For customers who do not live in France, it is possible to pay by credit card, bank transfer and paypal. 2. How to order by bank transfer? Simply order on the site and choose the payment method of your choice: "bank transfer". You will then have all the information necessary to transfer money from your bank (address, bank account information, order number). You will also receive a copy of these instructions by email. 3. I made a payment by bank transfer, and my order is still "awaiting payment". Why? Bank transfers are not immediate. If the money has been debited from your account, it takes between one and three business days for the transfer to reach us, and the order to be validated. 1. How to get the invoice of my purchase? You will also receive an automatic email with the invoice attached once the order is shipped. 2. How are charged overseas territories, Swiss and outside european union ? If the shipping address is located in the DOM-TOM, Swiss and outside EU, orders are invoiced without VAT (without VAT). The order and the invoice will be in euros HT, and settlement will be done on this basis. You have to pay to receive the package, customs clearance and dock dues in accordance with the law. 1. 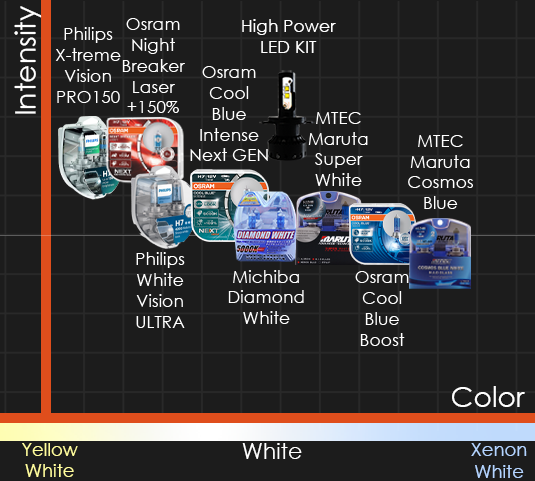 I would like to order headlight bulbs (H1, H7 etc ...), but I do not know which brand to choose. What is your advice? 2. What are the models that I use for my lights, low beam, high beam, fog (etc.)? The sidelights, also known as pilot lights, allow to be seen by other users, but do not see better. They must be turned on as soon as the brightness declines slightly, in addition to low beam. However, in the city, use only the sidelights is permitted if visibility is sufficient. The low beam allow to be seen by other users, but also to better see the road. These are lights that you primarily use the night to see the road. The hi beam are used only at night out of town. They must be disabled when you meet other vehicles. 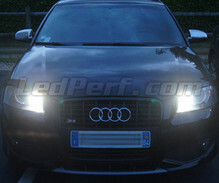 Daytime running lights, also known as DRL, used to be seen by other users at day. They are required on vehicles in circulation since 2011. They will automatically turn off when switching sidelights. The front fog lamps are used in addition to or instead of low beam in case of heavy rain, snow or fog. 3. 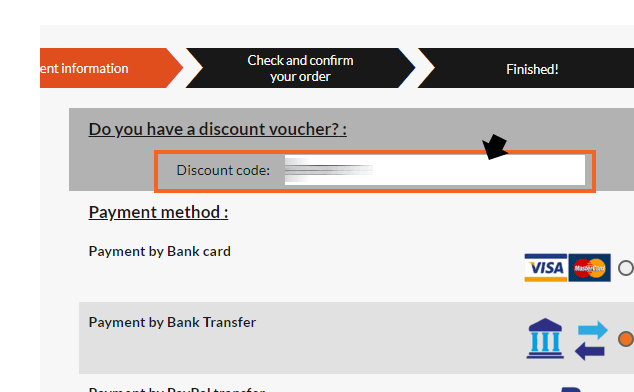 How to use a discount code or a credit? 4. Do you sell P21W, P21/5W, W21W, W21/5W, ERROR ODB (Computer Edge)? At present, there is no LED P21W, P21/5W, W21W, W21/5W without ODB error reliable on the market for high-end vehicles. Indeed, it is very difficult to dissipate heat resistance necessary without damaging the LED and optics. Problems encountered: lives only a few days, burning the optical beam and requiring replacement. Sample output with bulbs "platinum"
The installation is more difficult than with super white or platinum bulbs. 5. How to get a discount code? Simply click on "Like" and then on the "About"
6. I am part of a partner forum of LedPerf.com, do I get a discount? All information regarding a partnership are available directly on the partner's forum. It is therefore necessary to go directly to your forum to know the terms of the agreement. No discount code will be sent directly by email. A request by PM (private message) has to be made first on the partner's forum, you must be an active member. 7. Is it possible to add / remove items in a pack, and / or change the color of selected items? 8. Are you selling products in pairs or individually? Products are sold singly unless it is explicitly stated in the title or description. 9. Do you provide installation instructions in case of purchase of the LED unit? No. CD and setup files are only provided when purchasing kit or pack. They can not be provided when purchasing LEDs retail. 10. How do I know if a product is in stock before I order? Simply consult the stock indicator is on the product page. 1. Does it retains the dimming of the lights after installing LEDs? Yes, your lights will turn off gradually like your old bulbs. 2. 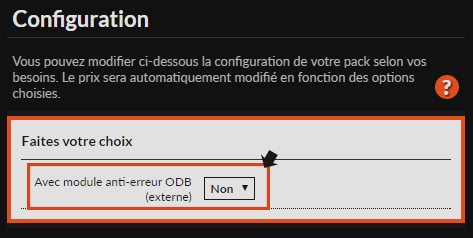 What is an anti-ODB error LED and an ODB error ? On recent and / or high-end vehicles, on-board computer (ODB) controlling the operation of the bulbs is present. This control consumption bulbs by sending electrical impulses to verify proper operation. A LED has a very low energy consumption, so the electronic system may determine that the bulb is burned out and displays an error message on the odb then the LED operates normally. If the onboard computer (ODB) deems too low power consumption, it can also cut power to the LED, since it considers the bulb burned out. Therefore, for models equipped with an onboard computer (ODB) checking the operation of the bulbs, you must order a free error ODB LEDs model. 3. What is the residual current? 4. How about the power and the base type of a headlight bulb? Just look at the metal part of the bulb appears when all of this information. 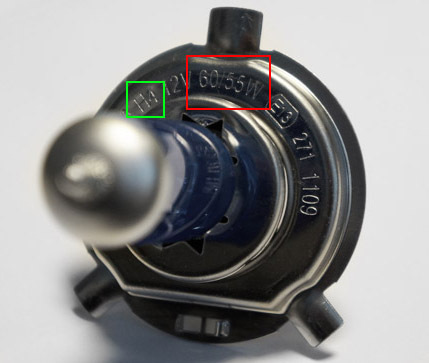 The bulb below is for example a H4 bulb (green box), power 60/55W (red box). 1. I get an error on the computer board despite buying led ODB without error. Why? Therefore, click on the link and follow the solutions for your vehicle. 2. My LEDs flash and / or turn off after a few seconds. Why? The flashing is a check of satisfactory operation of the bulbs by the onboard computer, which sends short electrical pulses. On conventional filament bulbs, this flashing is not visible because they need more power for lighting. But LEDs consume less, so these pulses can be seen. If the onboard computer (ODB) deems too low power consumption, the computer can also cut power to the LED, since it considers the bulb burns out, even if this is not the case. Therefore, check that you have ordered a model without error LEDs ODB. 3. I have not received my pilot or my pack pack my plate with luxury pack. Why? 4. My order seems incomplete at the reception. What to do? As stated in the email informing you of the shipment of your order and our general conditions of sale, it is imperative to check your order upon receipt and prior to any installation on your vehicle. Check all the quantities and patterns in relation to the product that is on the website. Attention claims must be made up to 48 hours after receiving the order. No claim will be considered if all these conditions are not met. 5. After installing my leds, some are slightly lit after sunset. Why? However, please note that this kind of leds have a lifetime less than standard LEDs. 6. One of my products no longer works. How to solve this problem? Simply fill out the form available here . A response to your request for service will be provided within 48 hours. Warning : return without our permission will be refused. 7. I have problems installing my equipment on my vehicle, or one problem after installation. What to do? Simply fill out the form available here . A response to your request for advice will be made within 48 hours worked. Requests made with this form are given priority. 1. How to request a change to my order? It is possible to request the amendment of an order placed on the site if it has not been prepared or stamped. The order is placed on hold, while your application is processed. A change request logically leads to delays in the preparation and shipment of the order.